Flock of CEDAR WAXWINGS in my weeping cherry tree this morning. They were taking turns going to my fountain for water, too !! Nice to see them so close, for a change !! 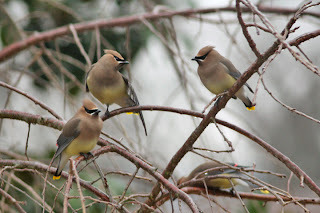 the pictures of CEDAR WAXWINGS are amazing. thanks for sharing them on your blog.